Adopting the right approach to researching & identifying the best domain name options can prove enormously beneficial in the long run. We can liaise with you to research these best options then register & managing the domain on your behalf. Registering the domain in your name (or your organisations) will guard against a need to prove ownership at a later date. 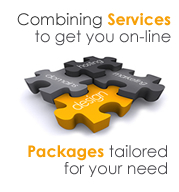 Our management will ensure that it points to your web site and that email is routed through to you correctly. Branding: What does it say about your company & the products & services you offer? Type: The best type of domain will depend your type of organisation & where you operate geographically. Trading: Domain registration can help protect your trading name etc. Please feel free to contact us if you would like us to check availability of domain names, discuss the best options & avoid pitfalls. Domain Names registration fees and minimum registration periods depend on the choice of 'top-level domain' (TLD). Fees revised 4th September 2007. You can read more about TLDs by clicking the 'Top Level Domains' tab above. Please Note: Domains are invoiced on an annual or bi-annual basis with the invoice issued before the renewal date. Clients wishing to cancel the renewal need to contact us a minimum of 14 days before the renewal date in order for us to cancel the renewal for the coming year/s. Domain names which are based on generic words like 'DIY' or 'digitalcameras' are called 'intuitive' domain names. The alternative is to use a 'proper name' or 'trade name' such as your name or the name of your organisation. The use of generic words in an intuitive domain name may help improve your search engine ranking a little. Google does index words from the url but most commentators suggest they have comparatively little value when compared with other ranking factors. Favour hyphens (www.digital-cameras.com) over underscores (www.digital_cameras.com). Further reading: Matt Cutts Google Blog. Should you register a hyphenated or non-hyphenated domain name? We suggest you register both, but importantly find non-hyphenated domains tend to perform better in search results. Non-hyphenated domain names are also easier to spell out over the phone and are perhaps more intuitive from memory. Hyphenated domains are easier to read and may help where inbound links use the domain name. The choice of which you should ultimately use comes down to business preference. A top-level domain (TLD) is the last part of your domain name - i.e. the letters that come after the final dot. For example the TLD in the domain www.mywebsite.com is 'com'. Top-level domains are grouped in three categories. Used by a country it is two letters long and the ccTLD for the UK is 'UK'. Used by a particular class of organisation - e.g. .com should be used by commercial organisations. These are three or more letters long. Most gTLD are available for use worldwide. Used exclusively for Internet-infrastructure purposes. Full lists of gTLDs and ccTLD are available from the Internet Assigned Numbers Authority (IANA). Should you register a .com, .eu or .uk? Again we suggest you register all if they are available! If your market is local or national as opposed to international then a .uk is probably the best choice. If you would like to market overseas then choose a .eu (for the European Community) or .com (worldwide) as appropriate. It is believed Google (and perhaps other search engines) prefer domain names that have been registered for an extended period. A longer registration suggests that the web site is likely to be more established and is not a temporary or test site. Registering for more than one year certainly reduces the administration work and will probably save money too. The following domains names can be registered for a minimum of 1 year and up to a maximum of 10 years. The following domains names can only be registered for a period of 2 years. Currently .eu domain names can only be registered for a minimum 1 year period. The domain name will need to be 'Unlocked' in the control panel where the domain name is currently managed. A clue to which company provides this service can be found by carrying out a 'Search Domain Ownership Records' at www.domaintools.com. It's important to ensure that the 'Admin' email address for the domain name is an address to which the transfer authorisation email can be received. Again, in the control panel where the domain name is currently managed there should be an option to generate an 'Authorisation Code' that will be sent to the 'Admin' email address to initiate the transfer of the domain name. The recipient (Admin Contact) will then key this code into the control panel of the Registrar to which the domain name is being transferred to legitimise the transfer. With the above completed we can initiate the transfer via our registrar. Please Note: Where a website & or email is associated with a domain name, it's always a good idea to plan & time the tasks associated with the transfer to minimise interruption to the website & any associated email. Nominet UK is the Internet registry for .uk domain names.